Where do I begin? Dinner was a sensuous, salubrious, satiating affair from my first sip of matcha. I nod in quiet agreement when My Best Friend thinks aloud that we do live a blessed life. Indeed, we are being showered with plates full of blessings this evening. Even the late afternoon thunderstorm earlier had calmed down to a powdery mist as we walked across the lobby of the Ritz-Carlton Residences to an understated small recess in the wall outlined with a white border and a noren (half curtain) marks the entrance to Takebayashi, the city’s first Kappo-style restaurant. Inside, the team, led by chef Tatsuo Takebayashi (picture), call out loudly in greeting. One side of the small, cosy restaurant is taken up by the kitchen, with a bar-counter running along its perimeter. A special feature of Kappo cuisine is that customers are encouraged to occupy bar-counter seats so they can watch the itame (chef) prepare each dish, and perhaps have animated conversations about the food itself. If preferred, they can sit at small tables or in a private room with a view of the iconic Twin Towers. We are offered green tea, an aromatic brew that soothes our throats and calms the mind. Then comes the first zensai (appetiser), a platter of 3 pieces of Cream Cheese With Miso (RM30). Take-san tells us that the cheese has been marinated with miso for three days and then lightly seared just before serving. I take a bite and feel the cheese melt into creamy bliss, with an added salty edge from the miso. This is not an appetiser to rush through. Small bites help prolong the moments of pleasure. On the side is a small red bayberry, sweet enough to just cut through the creaminess of the cheese. I am just thinking this is a dish that’s hard to beat when Cold Tomato Umami Jelly (RM45) is offered. Doesn’t look like much – just a whole momotaro tomato sitting on a cushion of chopped up jelly in hues of light tea. The tomato is skinned and cut into four for easy handling. The sweet crunch of the tomato is tempered by the salty, umami taste of the silky jelly, made with dashi and konbu. It’s glorious just allowing the delicate flavours to wash over my palate. This is followed by another cold dish, White Fish with XO Salsa (RM80). The fish served depends on seasonal catches and what is freshest. We have kinmedai or golden eyed snapper. The flesh is sliced into slivers and arranged like a fan with scoops of XO salsa (scallops, dried prawns, garlic) at one end and, on the other, sango radish sprouts and a bunch of grated daikon. Ponzu sauce is drizzled over the fish. It’s a good combination of flavours, with the salsa adding another level of taste and aroma to the fish. Takebayashi may not serve traditional Japanese cuisine but the Japanese spirit shines in every dish. For instance, his Chawan Mushi (RM45) has a topping of Dried Scallop Sauce that’s bursting with flavoursome sweetness. Steamed perfectly, the egg custard is silky smooth, with chicken, prawn, ginkgo and to my surprise, a small cube of yomogi mochi that gives an extra textural contrast to the dish. The Salmon Tataki Salad (RM50) comes with a Takebayashi signature, jalapeno sauce. The salmon, seasoned with salt pepper and charred on the outside, is allowed to cool before it’s sliced and arranged artfully on a bed of salad greens, sliced red turnip and a creamy jalapeno sauce. If you’re get the feeling you’ve tasted this somewhere, you may have, at Nobu. Not surprising, since Take-san was previously at Nobu KL for three years before he opened Takebayashi in September. This connection is his tribute to his years spent in Nobu. We are equally enamoured of Popcorn Shrimp Spicy Mayo Sauce (RM45) and amazed that the deepfried shrimp stayed crispy and hot even after the long photography session. It’s not all seafood. Takebayashi offers Grilled Wagyu Beef Tongue and Steak. Take-san prepares us his favourite Grilled Spring Chicken from his Omakase menu, served with a grilled chilli pepper, grilled white corn, cauliflower, brown sauce and freshly grated wasabi. Apart from beer and sake, Takebayashi stocks a range of wines, including its own brand (RM250/bottle; RM45/glass) of Red Croatian and White Malvasia from Italy. Our pick, the white Takebayashi Castello di Luzzano is a crisp, semi-dry wine that twirls a sparkling tango with the fresh seafood. I love the tiny, light bubbles that hints of prosecco and the long, aromatic floral finish. 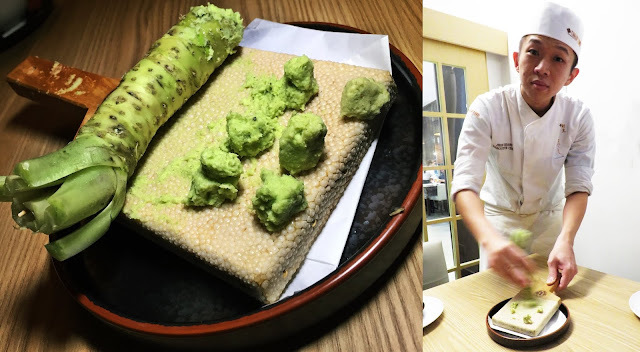 We have saved the sushi for last – just a piece of Toro (RM40) and Aji (RM10) each, with an added bounty in the wasabi, grated a la minute at the table with a sharkskin grater by Executive Chef Jhon Chan. Our dessert is a simple platter of juicy Japanese Nashi Pear and vanilla ice cream which helps somewhat to calm our palates still tingling in excitement from the exquisite samplings at dinner. Takebayashi serves a 7-course omakase menu (RM280) as well as a lunch set menu (from RM40) with rice, chawan mushi, salad, oshinko (pickled radish) and miso soup.